The tallest residential tower in Western Europe will be built by West India Quay . 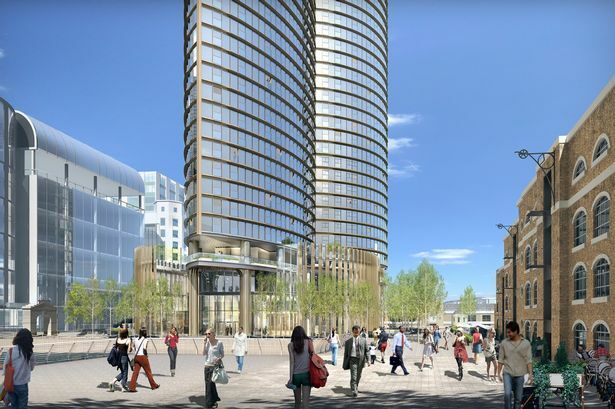 Tower Hamlets councillors cleared the plans for Hertsmere House on Thursday (February 18) despite hearing objections from neighbours about overshadowing and density. One called it a “stand-alone monster”. Committee chairman Marc Francis was one of the five councillors who backed the scheme but he said he did so “with a heavy heart”. Three voted against. Few people had complained about the tower itself – 67 storeys high, 861 new homes likely to house 2,500 people. Developer Greenland Group, based in Shanghai, said it was a showpiece and the generous space, high architectural standards and new public realms all met with approval. The “petal” shape and new piazzas at ground level were seen as positive. It was just in the wrong place, said objectors. It will sit next to Grade I listed Georgian bonded warehouses and the Credit Suisse building. Being only slightly shorter than One Canada Square, it will dominate the area. Canary Wharf Group, the Museum of London Docklands and Credit Suisse were among those who objected to the plans. The reason for the approval came from a fear of what might happen if the committee turned down the scheme. There is an existing planning permission for a single tall tower on the site that was rejected by Tower Hamlets councillors in 2010 but overturned by Mayor of London Boris Johnson. Whereas the present scheme offered generous community contributions – the equivalent of £50million including an entire stand-alone affordable housing scheme in Limehouse, the previous scheme offered very little, said councillors. They admitted that if this scheme fell through, the council would lose the contributions, the social housing and a possible return to a less desirable scheme of commercial space and serviced hotels. Cllr Francis said: “That was the first time the Mayor of London had intervened to overturn a local authority’s decision and it was a really frustrating time for us not least because that scheme delivered almost nothing for people of Tower Hamlets. “This scheme is, in some ways, worse for me because it takes a wider footplate and it’s a bulkier building but it makes a significant contribution to the community in Tower Hamlets and it would be a significant enhancement on what was approved by the Mayor of London. After the meeting Greenland Group senior planning manager Setareh Neshati said: “We are delighted that Tower Hamlets have decided to share our ambition to deliver a landmark residential building at West India Quay. “This is Greenland Group’s most important project in Europe. As well as delivering 921 new homes for Londoners, including 156 affordable homes, our scheme will revitalise this part of Canary Wharf and create a new prosperous environment that the whole community can enjoy. Previous articleHow did London become Fintech’s golden goose?